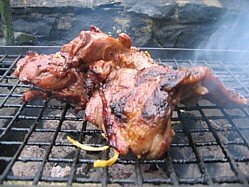 This brilliant butterflied BBQ lamb shoulder recipe was first cooked for me by my good friend Nichola. It’s ideal for the barbecue grill and has a wonderfully tasty marinade. Butterflied shoulder of lamb to me is pure man, meat and fire. There's no bones to worry about, just a big hunk of meat slapped on the grill, cooked and carved in thick slices. Pure indulgence! The roots of this recipe must lie in Spain because it’s heavy on paprika and with chilli and garlic to complete the mix it’s got to be a winner. There’s more paprika in the sauce and the combination of flavours achieved with the herbs is out of this world. I’ve chosen to use a boned shoulder but you can butterfly a small leg and get equally good results. The shoulder holds slightly more fat than the leg and I think that it adds to the succulence of the joint, my missus however prefers to do this recipe with leg because it's more lean. Well you can't please everybody can you? If you have bought a full shoulder then the hock will still be attached (this is the bone which goes down to the front leg) so the first job is to remove the hock. If you move the hock and shoulder you'll be able to detect where the joint is, once you've found the joint, slice through the meat all the way round the joint and finally cut through the joint itself - this will require a bit of brute force. Don't throw the hock away, they are fantastic slow roasted. Now you're left with the shoulder and you'll note that it has a blade bone (flat and triangular) that runs through the middle of the shoulder. Starting at the edge of the shoulder where the blade bone is closest to the edge use gentle strokes with your knife to cut the meat away from the bone. You are running your knife alongside the bone and pulling the meat way rather than actually cutting into the meat itself. When you've completed one side, turn the shoulder over and remove the meat from the other side until the blade is free. To remove the remaining bone joint is a continuation of the process of scraping the length of the joint in steady stokes to gradually tease the meat away from the bone. Use a sharp knife and keep your other hand well away from the blade, better still, get yourself a butchers chain gauntlet. 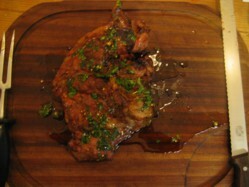 If you learn better by watching and listening then you can learn how to butterfly a lamb shoulder in this video. Note:- If you don't fancy it then your butcher will take the bone out for you. Just explain to him / her that you want to then grill the meat as a slab on the barbecue and you should end up with a nice big hunk of meat that's about 2 inches thick in the most part. All the ingredients in this bbq lamb recipe are fresh so there's no allergens to worry about. TIP - Add the herbs to the sauce at the last minute so that they maintain their structure and don’t wilt. Prepare the ingredients for the marinade in a jug. Your butterflied lamb shoulder will be one thick slab but varying in thickness so with the skin side down, make some cuts into the deepest part of the lamb to create a greater surface area for the marinade to work. Place the shoulder skin side down in a non metallic roasting tray, pour the marinade over and rub it into the lamb. Put the lamb to one side for a 30 minutes or so whilst the marinade works it's magic. Provided your lamb shoulder was refrigerated when you started you don't need to return it to the chiller during the marinade stage. The coals on the barbecue grill need to be pretty hot and when ready slap the lamb on skin side down (beware the risk of flare up) and sear for 20 minutes. Flip it over and give it another 10 minutes. It's a double edged sword whether to do skin side down first or not. The skin side has most of the fat which will melt in the heat and could cause a flare up. 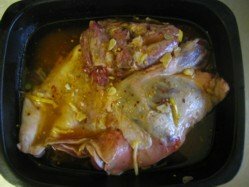 Conversely the skin protects the meat, keeping it more succulent and I think that this gives you better control over the cooking and you've more chance of having the lamb done to your liking - especially if you like it pink like me. When done to your liking, pop your BBQ lamb skin side down onto a carving board and prepare the finishing touch to this butterflied BBQ lamb shoulder recipe...the sauce. Just throw all the sauce ingredients into a jug and giving it a stir. Pour some sauce over the lamb, carve in thick slices and save the rest of your sauce for your guests to pour over a slice.